"Bushido is a game of savage battles, of cunning stratagems and last-ditch defences, and where debts of honour are paid in blood. In Bushido, the fate of the world hangs not on armies but on individual heroes, men and women of extraordinary capacity, attuned to the all-permeating life force known as Ki. This force is the very fabric of the universe, and those with the appropriate training or natural talent can tap into this energy source and gain seemingly superhuman powers. In the world of Bushido, the delicate tapestry of Ki – and thus the universe itself –is threatened by the forces of imbalance, and it is up to you to protect it – or help rip it apart. In a game of Bushido, nothing less than the universe itself is at stake. Are you ready for the challenge of the Way of the Warrior?" 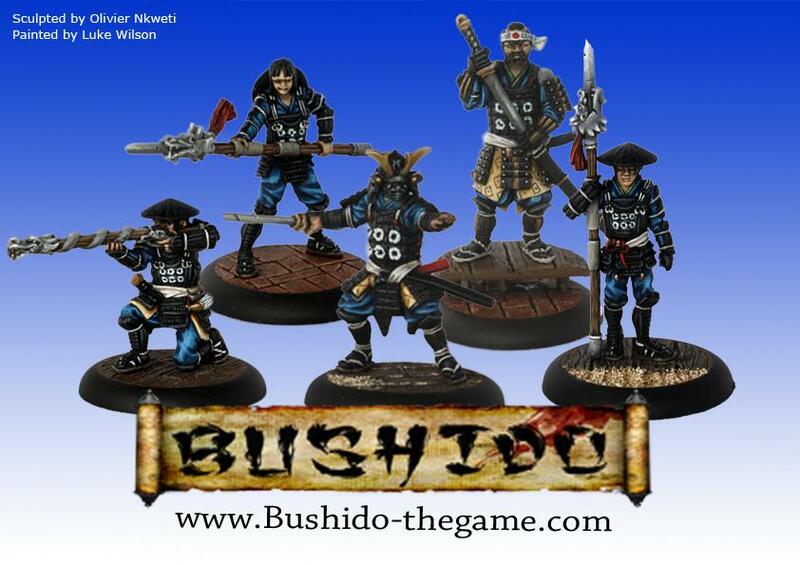 Bushido is an oriental fantasy tabletop miniature battle game for two players. Each player commands a force of no more than a handful of individuals, represented by 32mm metal miniatures. These forces meet on the battlefield and the commanders (the players, that is) try to outwit, outfight and outlive the opposing force and fulfil their battle objectives while denying the enemy theirs. If you have played tabletop miniature games before, Bushido falls into the ‘skirmish game’ category: all miniatures represent individuals and your force consists of a small group of unique characters rather than a big faceless army. A game of Bushido is fast-moving, flexible and filled with strategizing, counter-strategizing and counter-counter-strategizing. Your tactical acumen is important, but as dice add an element of randomness, so too is your ability to think on your feet. "The Dragon Clan won the rights to colonize the Westward Isles in a series of duels with their rivals, the Shiho Clan. However, when the Emperors vessel expired, and his young heir too young and inexperienced to concern himself with the pretty disputes at the fringes of his lands, the promise of sole settlement rights died with him. The newly formed Prefecture of Ryu found themselves yet again in conflict with their old enemies, the Shiho Clan. Now, the Prefecture’s grasp of power is weakened, due to the recent Tsunami. Their forces are in disarray, they are fighting on all fronts in the aftermath of the disaster. But still the men and women of the Dragon are ready to take their place at Destiny’s table, uniting the human world by defending it against all threats." There was even a weapon and head option for Hiro Takashi, The Dragons claw. Flaming sword and head without helmet. nice work Kenzie. Im hoping to post up a pic of my first Bushido miniature tonight.